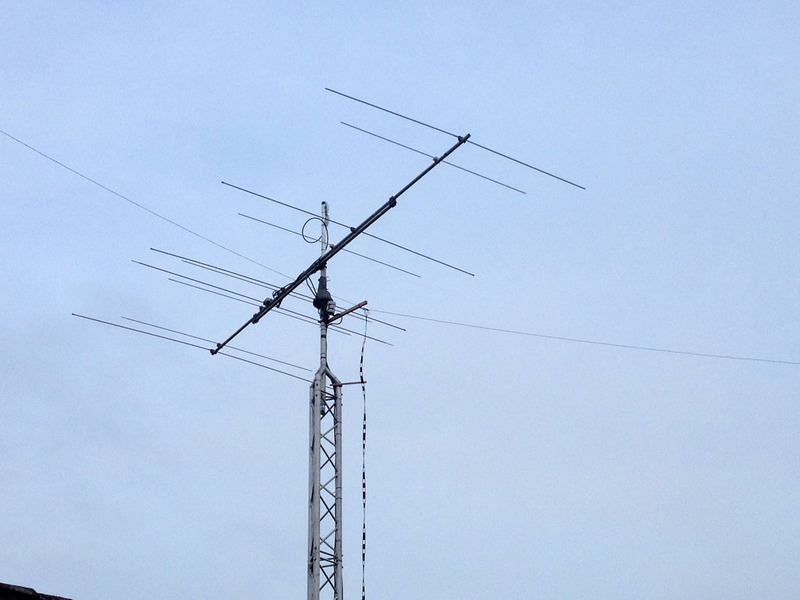 Last week, I put up a dual band antenna for 6 and 4 metres. It was difficult to decide what to build. Last year, I had separate antennas for both bands. Dual band antennas are attractive, because of lesser wind load and also because it leaves some room for other antennas. Another aspect was that the distance between the antennas is limited and the field strength is relatively high and one has to take care not to destroy the input stage of the receiver on the other antenna. With a single feed and a coax switch, this is no problem. As I am using the same transceiver for both bands, I do not listen on two bands at the same time anyway. With nearly all dual band designs that I came across, I was not happy with the vertical radiation pattern. Most of them show bad side lobes, up to about -5 dB relative to the maximum. With all the man made noise, a clean pattern helps to reduce that. Just after I decided to go for the separate antennas again, I stumbled upon a YU7EF design that had an attractive pattern. Although the gain is some 1 dB less than optimum for the boom length, the plan changed again in favour of the YU7EF 5/5. The length of the former 50 MHz yagi elements fitted nicely and I only had to change the feed and add 70 MHz elements. It took a bit of perseverance to get it matched on 6 metres. On 4 it was more or less right from the start. The driven element for 6 was used with a hairpin and 1:4 balun and was shortened quite a bit, so I had to lengthen it again. A choke is used to block common mode currents and it matches quite well. SWR is better that 1:1.5 on both bands. Today, I put a signal source on the roof of the house, which is about 25 metres away from the antenna, to get an impression of the horizontal radiation pattern. It does not deviate much from the calculated pattern, which indicates that its performance should be acceptable. On 6 metres, the F/B is a bit better than on 4 metres, but quite satisfactory on both bands. I also noted that noise from LED lighting (crap) on a garden house of one of the neighbours is less than before, so that also indicates that the vertical pattern improved with respect to the previous 6 metre yagi (which was a 4 element on the same boom). .
Over time, it will become clear how it performs and when the Es season starts, I should be able to benchmark it. I also plan to put a Tonna up for a comparison. I know from the past that the Tonna performs good, so if the dual band antenna renders the same result, I will be satisfied.